Celebrate the return of spring with Art in Bloom, the Museum’s annual festival of fine art and flowers. Enjoy exquisite art from across the MFA’s collection paired with magnificent floral interpretations created by New England-area garden clubs. Professional designers delight with creative designs in Museum entrances and public spaces. Art in Bloom launches with a preview of freshly installed arrangements on Friday, April 26, from 3 to 10 pm. Daily events include tours of flower arrangements throughout the galleries; demonstrations of floral arranging for your home; casual dining among masterpieces; and outdoor walking tours. Browse the MFA Art in Bloom Market and Garden Cart for unique gifts and treasures. The popular Member Night is Saturday, April 27, and Community Day with children’s activities is Sunday, April 28. Free Ikebana demonstrations on Saturday from 3 to 4 pm in Remis Auditorium. Remco van Vliet is a third-generation master florist from the Netherlands and creative director of Van Vliet & Trap Event Design of New York City. Van Vliet & Trap Event Design creates the stunning colossal urn arrangements and accompanying bouquets on view each week in the Great Hall at The Metropolitan Museum of Art. Van Vliet is also a master florist with The Flower School New York sharing his vast knowledge of floral design and composition. Join us on Sunday, April 28, as Remco van Vliet presents an inspiring lecture and creates spectacular arrangements from classic to contemporary that will inspire arrangers of all generations. Create your own floral arrangement with inspiration and guidance from Master Florist Remco van Vliet, creative director of Van Vliet & Trap Event Design NYC. Remco van Vliet: Still Life, Still Alive! Floral demonstration and lecture by Remco van Vliet with creative techniques for designing spectacular arrangements from classic to contemporary. Experience great shopping opportunities at this year’s Art in Bloom! The Garden Cart features its signature floral teacups and many new flower- and gardening-related items. The Shapiro Family Courtyard blooms with specialty items for your shopping and gifting pleasure. Artisan vendors sell jewelry, table wares, garden objects, accessories, and much, much more! Casually elegant prix fixe three-course menu with paired beverage. Live musician accompanies your dining experience. Reservations at 617-369-3487 or limited walk-ins. Bring your group of ten or more for a private guided tour of the floral arrangements or opt to tour the galleries on your own. 10–15 people per private guided group tour. Advance reservation required. Member discounts do not apply. Note: reservations for self-guided group tours accepted through Monday, April 22. 10 or more people per self-guided group tour. Advance reservation required. 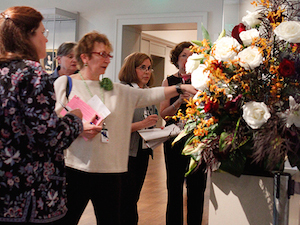 Wander the galleries with a program map and discover this year’s freshly designed arrangements. Make an evening of it with cocktails or dinner at one of the Museum’s restaurants. Join floral designers from three Boston-area chapters of Ikebana schools—Ikenobo, Ohara, and Sogetsu—as they create arrangements showcasing the design principles of each school of Japanese aesthetics. Enjoy a members-only viewing with tours, shopping and dining. Admission based on membership privileges. Celebrate Art in Bloom with family-friendly programming and entertainment. Tour arrangements throughout the Museum. Enjoy continuous demonstrations of floral arranging for your home. Discover the MFA’s architecture, outdoor sculpture, and neighboring gardens. The MFA is committed to accessibility for all visitors. For information, visit Accessibility, e-mail access@mfa.org, or call 617-267-9300 or 617-369-3188 (TTY). Wheelchairs and walkers are available at all entrances, first come, first served. Bring your group of ten or more for a guided tour of the floral arrangements or opt to tour the galleries on your own. To book a group tour, complete our reservation form.